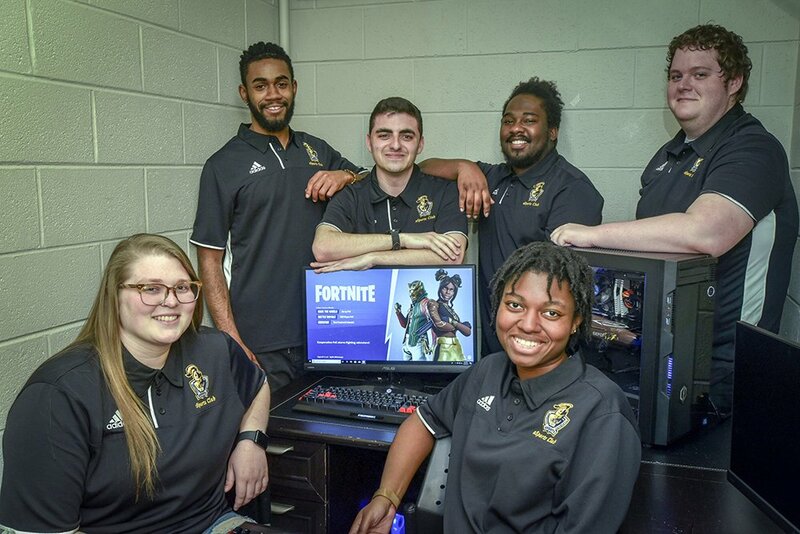 The 2018-19 eSports team includes (seated) Deidre Turner and Gabrielle Wilson; and (standing) Darryl Richardson, Nicholas Kelly, Daekwon Sequira, and Duncan McNeil. “We compete in teams of two and the winner is based on whoever receives the highest number of (on-screen) kills,” says Deidre Turner, who is one of the six members of Neumann’s new eSports team. In the fall of 2018, Neumann began its inaugural season of ECAC eSports, which is a league of online video game competitions. The ECAC eSports league, which began in 2016, currently includes 23 schools and 117 teams within these participating schools. Presently, the ECAC offers competitions in a variety of different games such as Fortnite, League of Legends, FIFA, Overwatch, Hearthstone, and Super Smash Bros.
Neumann’s eSports team participates mainly in the Fortnite competitions. Released in 2017, Fortnite is an increasingly popular video game that requires both strategy and skill. Esports allows these players to apply their skillset in a competitive environment that is more than just a popular pastime. Leading up to these competitions, members of the Neumann eSports team practice both individually and as a team. Despite many practices and matches being held solely online, there are still great connections being made both within the club and outside of it. “The biggest thing is that you get to meet so many cool people through eSport matches,” says Duncan McNeil, who practices with members from opposing teams, “it’s all about the connections that are made.” Occasionally, the ECAC hosts in-person tournaments. These matches can be attended physically or streamed online. In some ways, ECAC eSports is very comparable to other collegiate sports. “Similar to most sports, there is a playoff structure within the ECAC. I am not currently aware of a national competition that would expand outside of that, but new leagues are forming every day, so I would not be surprised if that is on the horizon,” says Dave Deal, director of campus recreation. Esports is certainly gaining popularity. Comcast Spectator recently announced that it will be constructing an eSports gaming arena in the very near future. The 3,500-seat arena will house a large audience that can watch players compete in their video games. According to a February 2019 article in Inside Higher Ed, some universities are incorporating eSports into their academic programs and others are elevating clubs to full team status. Several colleges have even begun offering eSports scholarships. The National Association of Collegiate Esports, which began in 2016 with six members, has grown to include 128 colleges. This popularity is sure to project growth within the Neumann University eSports team as well. “Similar to most sports teams at Neumann University, the eSports club is always open for new members,” says Deal. In fact, the team is actively recruiting and is looking to expand into other games. Interested members should email Dave Deal at deald@neumann.edu.